Free Shipping Included! 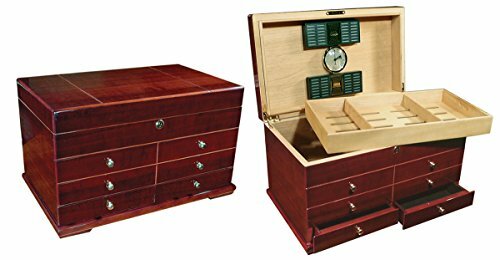 Prestige Import Group Landmark Large Humidor with Drawers - Color: Cherry Finish by Prestige Import Group at Blog Free Here. MPN: 9280-24. Hurry! Limited time offer. Offer valid only while supplies last. With enough room to store up to 300 cigars, the spacious interior & the handsome appearance of the Landmark have made it a cigar smokers' favorite. With enough room to store up to 300 cigars, the spacious interior & the handsome appearance of the Landmark have made it a cigar smokers' favorite. This Landmark is a Deluxe humidor chest in burl wood veneer with a high gloss finish. Features two drawers to store your cigar accessories, a gold lock with spare keys, & internal brass gold locking hinges with heavy duty center hinge for additional lid support. The Landmark is equipped with a huge lift-out spanish cedar tray and 2 large humidifiers to insure proper humidity distribution. This humidor includes 2 spanish cedar dividers to further section off your cigar collection. Find Humidors like these in your local cigar retail shops for $300+! Fully Lined with Authentic Spanish Cedar.